The answer is Lyell Creek, Kaikoura. 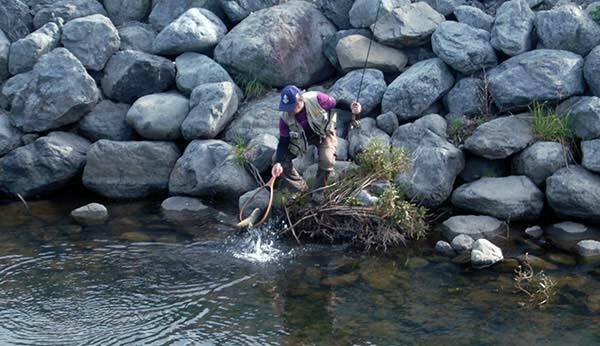 Here he is again drifting a fly down to another brownie in Lyell Creek which is a little stream flowing through Kaikoura township. Onlookers where impressed with his obvious skill. There were 15,000 x 50g quinnat salmon smolt released for Nelson Marlborough Fish & Game into Kaikoura’s Lyell Creek back in July this year for Kaikoura Salmon Enhancement. 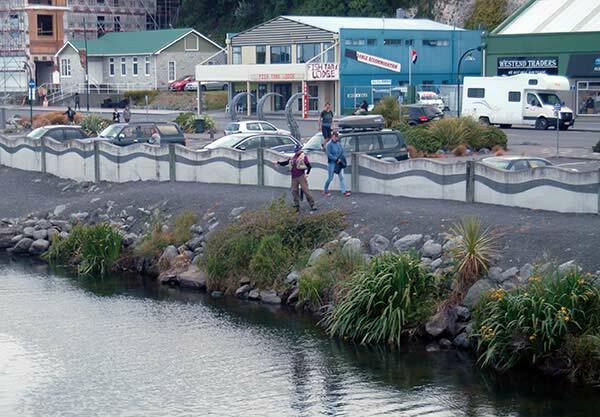 It is hoped that even more salmon will be caught at Kaikoura, particularly from the beach behind the railway station close to Kaikoura township. Quite a few sea-run salmon have been caught from this beach in past years as they migrate south to the bigger river-mouths. Most salmon caught from the beach at Kaikoura are around the 12 pound mark. Spinning with a ticer is the way to catch them from the beach. Even if you don’t catch a salmon there is a good chance of catching kahawai as big schools often come right into the beach. As you can see from the pictures there are even good sized trout in the creek right in the middle of town!